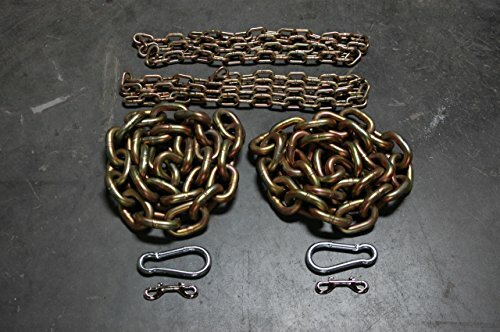 This is a 65.6 lbs Weight Lifting Chain Package that comes with the following: 2x - 5 foot pieces of 5/8" chain 2x - 5 foot pieces of 1/2" chain 2x - 6 foot pieces of leaderchain 4x - couplers for adjusting. Total weight: 65.6 lbs - 32.8 lbs on each side. About: Working out with chains has many additional benefits. In addition to the resistance to your workout you can gain, chains can help train lifters to overcome weak spots and improve form. During the lift, most strength comes from the top of the lift. Through adjusting the chain's length off the ground, you can match the resistance and height to the person making the lift. During the bench press using chains, the resistance is reduced when the barbell is closest to the lifters chest. When the barbell is raised, the chain is also raised which creates increased resistance via weight. This method helps a lifter improve their lift by encouraging a more rapid lift as well as improved stability. You may see some manufacturers using collars on barbells. The challenge with them is that the fixed position on the collar doesn't accommodate various body types, strengths and barbell heights. Collars are overpriced as well ($25+ per collar) and simply create another challenge rather than solving one. We provide multiple hooks that allow you to safely wrap the barbell and adjust the length as needed. No collars to fuss with, ever. If you have any questions about this product by Advantage Rigging, contact us by completing and submitting the form below. If you are looking for a specif part number, please include it with your message.